This recipe has a shortcut, so it’s not as complicated as it sounds or looks. 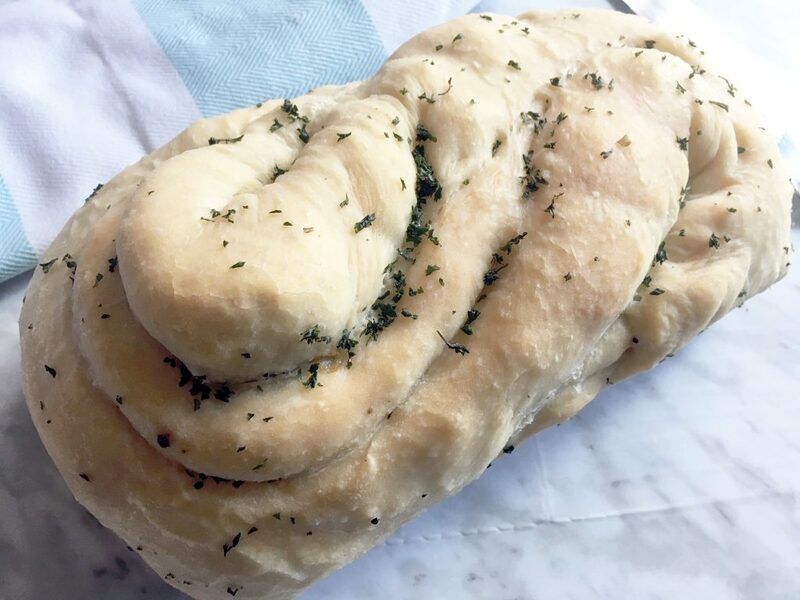 Instead of making bread from scratch, I just use some pizza dough. They usually have fresh pizza dough at your local Italian store or bakery. I normally pick up a couple balls of dough since they freeze quite well. Perfect for having in the freezer for when that craving for pizza or this samosa bread hits. All you have to do is make the beef filling and put it together. No one would guess that it’s this simple! Best to keep the pizza dough shortcut a secret. Roll out the pizza dough to as large as you can. Sprinkle 3/4 of the meat down the centre of the dough. Roll up one side of the dough over the meat. Sprinkle the remaining meat over the fold. 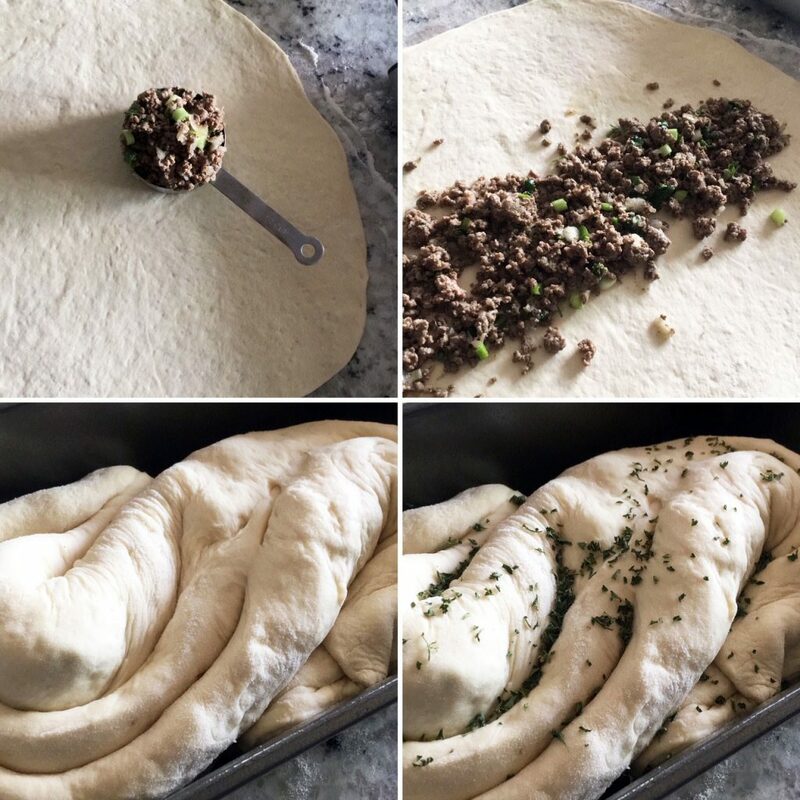 Roll the dough so that the newest meat layer is covered with the dough. Fold the log and fit it into a loaf pan. Sprinkle with dried parsley. 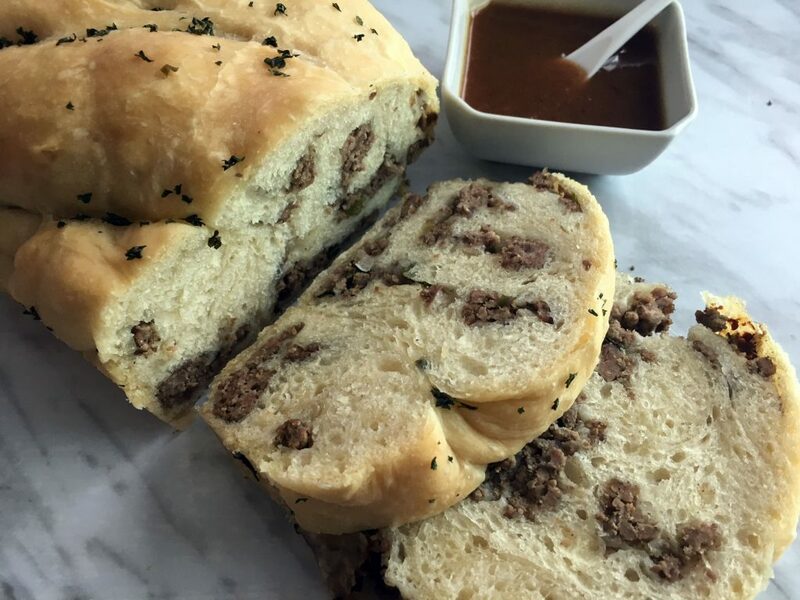 The result is a loaf with the flavourful beef in almost every bite. Served with a tamarind chutney, this is perfect for an appetizer or a snack with tea. The filling can be made before hand. Sometimes, I’ll make a batch of the beef and keep it in the freezer. In a pan, put a little bit of oil and cook the ground beef. As it cooks, add the garlic, ginger and cumin. Once the beef is cooked, add the onions and cilantro. Roll out the pizza dough to as large as you can. Sprinkle 3/4 of the meat down the centre of the dough. Roll up one side of the dough over the meat. Sprinkle the remaining meat over the fold. Roll the dough so that the newest meat layer is covered with the dough. Fold the log and fit it into a loaf pan. Bake at 350 degrees for 30 minutes or until the loaf is golden. You definitely caught my attention with that title! I love samosas so I can't wait to give this bread a try! I want this right now! I love pizza, and I love samosas, so this is perfect! This looks so good, and so easy, too Pinning to try. This sounds like a brilliant idea. I could definitely see myself gobbling this up!